T-Mobile G2: US gets HTC Desire Z early? T-Mobile has announced the arrival of the G2, its latest 'with Google' handset, made by HTC – looking very much like the rumoured Desire Z. Currently only available in the US, the T-Mobile G2 is the first smartphone specifically designed for T-Mobile's new HSPA+ network2, which means super speedy downloads using the US' 4G network. However, of more interest is that this phone has been pictured in numerous spy shots as the HTC Vision – which is likely to become the HTC Desire Z, the phone tipped to be launched later this month. The T-Mobile G2 is (shockingly) the direct successor of the T-Mobile G1, which was the first Android phone on the market way back in October 2008. The T-Mobile G2 has been given a large 3.7-inch screen which has a hinge design that opens to reveal a full QWERTY keyboard. It has been built on Android 2.2 and offers the usual seven customisable Home screen panels, including a dedicated panel with one-click access to Google apps, such as Android Market. As it's 2.2, Flash player is enabled and the phone packs 4GB internal memory with an 8GB microSD card included, with support for cards up to 32GB. There's also a 3.5mm jack and Swype pre-installed, which is a bit of a bonus. Chip-wise, the T-Mobile G2 is powered by a Snapdragon MSM7230, which offers an 800MHz CPU speed. There's is also HD video shooting on board, with the G2 having a 720p HD video capabilities and a 5MP camera, complete with LED flash and autofocus. The T-Mobile G2 has also been optimised with Voice Actions, so you can shout orders at your phone and it should obey. Current T-Mobile customers in the US will get exclusive access to preorder the G2 starting later this month. 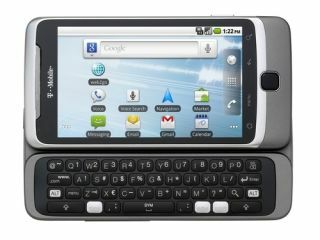 There is no UK release date for the T-Mobile G2 just yet, but we will keep you posted as soon as we get further details. UPDATE: The phone contains both Google Voice and Voice Actions. Google Voice will transcribe voicemail to text, while Voice Actions will allow you to search using your voice.